Interstate & US highways, Amtrak trains, interstate and regional buses connect this Connecticut River town to Vermont, New Hampshire and the rest of New England. White River Junction, where Vermont's White River meets the mighty Connecticut River, is just across that river from Lebanon, New Hampshire. Two Insterstate highways, I-89 and I-91, and two US highways, US 4 and US 5, plus several state highways come through this transport-happy urban area. Cape Air connects Lebanon Municipal Airport (LEB), right across the Connecticut River 3 miles (5 km) from White River Junction, with Boston's Logan International Airport (BOS) and New York City's Westchester County Airport (HPN) and, via land shuttle, to Pennsylvania Station (ZYP). 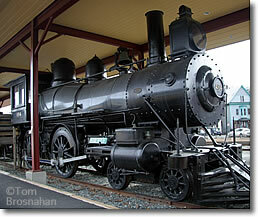 Historic locomotive on display at the train station in White River Junction, Vermont.